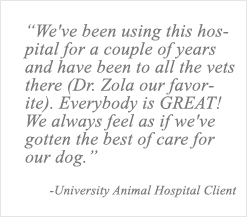 University Animal Hospital offers pet boarding for dogs, cats and some exotic pets. Boarding reservations are necessary as both our cat and dog boarding kennels fill up quickly. We strongly recommend you call several weeks ahead of time to make a reservation for your pet. 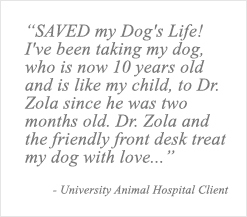 When you absolutely, positively, have to leave your pet overnight, leave him or her with our animal hospital. Your pet will be closely monitored and supervised by technicians and animal attendants who are on premises 24 hours a day, seven days a week. If a problem arises, or if your pet needs special attention or treatments, our veterinarians are available during weekends, holidays and every night when the hospital is closed. Rain, sunshine, sleet, or snow, our kennel attendants walk each dog individually 3 – 5 times per day. To accommodate our feline guests, cat boarding is completely separate from dog boarding. Our boarding facility has the the same hours of operation as the hospital. We are open Monday through Friday from 8 a.m. until 8 p.m. On Saturday, we are open from 9 a.m. until 4 p.m. We strongly recommend you arrive at least a half hour before closing time. There are no admissions or discharges on Sunday. For the benefit of your pet, as well as the health of other pets, all Manhattan pet boarding guests must be up-to-date on vaccinations prior to being admitted into our facility. If vaccines have not been administered at University Animal Hospital, you must provide acceptable proof of current vaccination status. Any vaccinations due at the time of pet boarding must be administered by a University Animal Hospital veterinarian at admission. This policy is for the safety of all our guests and there are no exceptions. At check-in, a staff member will ask you for an emergency phone number and contact person, feeding instructions, health concerns, medication instructions and grooming options. This will ensure your pet gets the proper care and attention required during his/her stay. We feed our boarding guests Hills and Eukanuba premium foods; however, if you prefer your own pet food, please provide it in a waterproof plastic container and label it with your pet’s name. Should a pet need medical assistance, every effort will be made to contact a family member to discuss treatment options. If immediate attention is needed, one of our veterinarians will begin treatment and discuss follow up care by telephone or at check out time. Please inform us if your pet has allergies or any medical conditions. If a guest requires medication, it will be administered by our boarding staff for a nominal fee. If you bring any personal items, we may write your family name on the items with permanent ink. We are not responsible for loss or damage to any personal items. Please call University Animal Hospital for our current pet boarding rates. Complete pet grooming services are available as well. Our professional groomer can groom your pets before they go home.